“St. Charles Parish has had no issues with the AM Radio station your company installed. We've been at it for 8 years and the system never really had any complications. For that, we thank you!...We appreciate everything you guys have done for us." When it all goes down, ALERT AM stays up. Hundreds of communities across America operate ALERT AM Emergency Advisory Radio Stations to tell citizens what to do during incidents that threaten life and property. No power? No internet? No problem. With the ALERT AM system, listeners receive up-to-the-minute reports and instructions across a 3-5 mile radius (25-75 square-mile area) with a level of detail that makes the broadcasts invaluable. During non-emergency times, officials use the stations to inform motorists of street repairs, traffic constraints, travel advisories, city history and visitor information. Information Station Specialists is the sole provider of ALERT AM in the United States and offers 24/7 remote technical support for the life of the product. State and local governmental entities may purchase our products without going to bid, if they join the HGACBuy purchasing cooperative as end users. Membership is free. Here's how easy it is to join. The below capabilities establish the ALERT AM system as a unique communication tool that produces effective public response and appreciation, 24/7. Local, phone, IP and USB control interfaces. HQ5.1 broadcast quality audio processor to increase audio quality. Voice-prompter-style digital recorder with 3 hours of recording time, hundreds of playlists and 1,000-message capability. Redundancy. Live broadcasting locally or remote. External control triggering via siren, pushbutton or other alarm. Transmitter type accepted with 15-year proven track record, synthesized frequency design for agile operation with full 5000 Hz bandwidth audio. Secure indoor cabinets, dual-door rack style. National Weather Service 'all hazard' encoding to automatically broadcast Emergency Alert System messages targeted to specific counties. Diagnostic metering and test equipment. Hardware, cables, power supplies and illustrated manuals. Remote tech support for the life of the product. Potential interference notification services for the life of the product. Computer-controlled audio programming by dedicated PC. StreamCASTs that broadcast messages to smartphones, tablets and laptops to boost indoor and out-of-area listening. ENcast to automatically interrupt broadcasts to air text-based emergency messages from compliant mass-notification systems. 4-day operational battery backup to keep the system on the air during power outages. Vertical Profile Antenna System, an efficient hurricane-rated, ANSI/TIA-compliant antenna solution that saves space and installation time. GPS frequency stabilization that allows synch of multiple stations to effectively enlarge coverage. Flashing ALERT Signs to encourage motorists to tune to emergency stations when beacons flash. 2X Signal Booster with up to double the efficiency/range of the standard antenna. Outdoor weatherproof cabinets for isolated locations without host buildings. Signal Measurement Radio Receiver to verify FCC compliance. See the Technical Specifications webpage for details. See a webpage listing features only ALERT AM has in the marketplace. Who operates ALERT AM systems? Municipalities (cities, counties, townships, boroughs, towns and villages): e.g., departments of public safety, emergency management, public health and public information (PIO). Points of entry: e.g., airports, border protection, port authorities). Universities and colleges. Government agencies (federal and state): e.g., departments of transportation (DOTs), bridge authorities, emergency management and public health departments. Click the map below to see alert stations across America - state by state. The ALERT AM system can be controlled over a network, USB, landline/cellphone or via a two-way transceiver provided by the operator. When optioned, messages can be managed on a PC workstation. The ALERT AM system allows the operator to pre-record messages for quick broadcast as anticipated emergency scenarios present themselves. 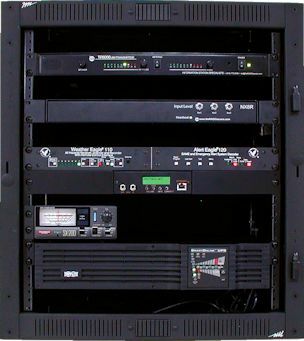 Broadcasts may also be triggered by ancillary devices, i.e., siren-system closures, switches or other external sources. This allows ALERT AM to quickly switch from broadcasting general information to specific emergency information if disaster strikes. When the National Weather Service issues all-hazard Emergency Alert System alerts for designated counties, they are broadcast automatically, interrupting standard programming. ALERT AM also allows the operator to lock out NOAA alerts if necessary. Broadcasting live is easy with the push of a button and can be effected at the radio station itself or remotely from any telephone. ALERT AM’s digital message player comes stocked with pre-recorded emergency management messages prepared by our professional announcers to illustrate what’s possible within the system. In addition, you may take advantage of our free or commissioned recording services to create broadcasts. An audio processor boosts audio quality and receivable range. Yard Style: ALERT AM may be installed at a building with the electronics securely indoors and the antenna pole mounted in the adjacent yard connected by an underground cable. This style is recommended because it is most economical and affords the greatest security for equipment. A 50’ separation from buildings is recommended. Isolated Style: At remote locations where there is no building, a weatherproof cabinet containing the electronics is attached to the antenna support pole. The location must have electrical power and, if equipment is to be remotely controlled, telephone, two-way or network service. If a yard- or isolated-style installation is not possible, custom installation on a building roof is possible in some instances. Lateral separation of the antenna from large, nearby objects by at least the height of the object is suggested to prevent signal degradation. We can provide documentation that radio frequency exposure from the ALERT AM antenna does not exceed FCC limits for safe operation. 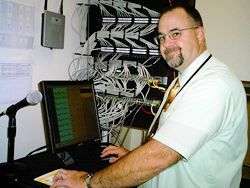 As you would expect, Information Station Specialists provides a full menu of technical services to help you put and keep ALERT AM on the air. We will help plan and implement your station, including frequency and site selection, FCC licensing, installation, staff training and the FCC-required field survey and documentation. Even professionally recorded audio messages are available, so your broadcast is ready to put on the air as soon as the station is turned on. Best of all, each system comes with Remote Technical Support and Potential Interference Notification Services (PINS) for the life of the station. The Information Station is a lower cost alternative with many of the same messaging capabilities as ALERT AM but without the specialized 'all hazard' broadcast capability, four-day operational battery backup and GPS frequency stabilization options described above under.